As a veteran of our Navy’s submarine service, I have an affinity and respect for the women and men who have served in our country’s armed forces. On Veterans Day as a kid growing up in a military town, I liked the parades best. Watching the marching bands, the fire trucks and former service members in lockstep with a glint in their eyes parade down the main streets was awe inspiring. Who knew that 12 ½ years after my eighth birthday, I would be getting sheep shorn at the San Diego R.T.C. Following the footsteps of my Pop, his brother and their father, I joined our Armed Forces. Service to our country is something we do, as do many others. I recall when I was about 14 getting into my Pop’s Army footlocker, which he kept stored in our garage. I found and donned his Army O.D. green uniform—including hat, belt and shoes! I made my way to my Mom’s sewing room, and she about dropped her sewing things. Once she recovered from her shock, she tearfully found an old photo and note my Pop had sent to her from Europe—showing him in that very uniform! 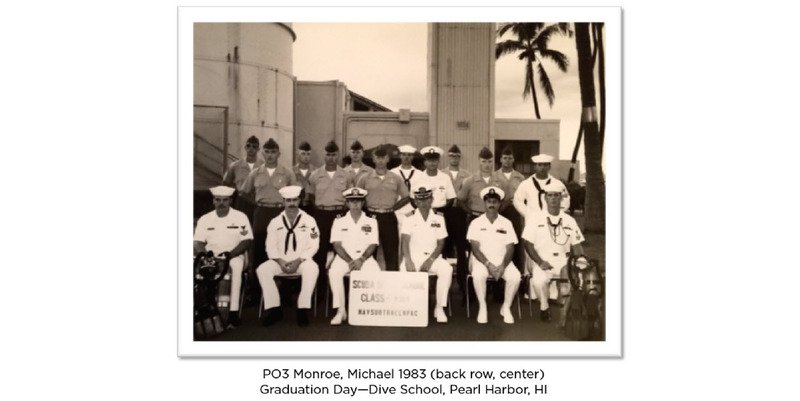 Being a member of our submarine force was indeed an honor. As one of three ships’ divers, I was in heaven. I look back on my time in service fondly and am grateful to have served with some of the most qualified and motivated men in our Navy. Earlier this year I attended a reunion with my shipmates. It was like stepping back in time. The sense of camaraderie and fellowship brought me right back below decks as though time had stopped…and the world went on around us. The only thing missing was the combined scent of hydraulic oil and amine hanging in the air like “Eau de Submarine” cologne. We’re all brothers and sisters in arms having taken an oath to protect, defend and serve our country. So this Veterans Day let’s take in a parade, fly our flags proudly and thank a Vet for being a part of what makes our country such an amazing place in which to live.